~ I lost 1.5kg this week. That's actually a bit more than I'd like because I believe that anything over a kilo a week is likely to be waterloss, and being a full time breastfeeding mum, I can't afford to become dehydrated, but YAY! I'm still happy for having lost more weight! oh love that square dinner set... vry funky! And wow another 1.5 kgs... you are doing so well... wish I had half your motivation! 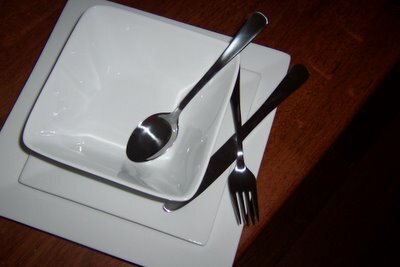 That is a beautiful set of dinnerware! !